An integrated marketing agency, Ocreative focuses on hunger, culture, and crew. It was 2003 – a time when the phenom, iTunes Music, had just rocked the market, but other online giants like Twitter, Facebook, and YouTube did not even exist yet. The dot-com bubble had burst and 34% of the U.S. population was using dial-up internet. Andrea Koeppel, a fresh-to-the-market, award-winning designer, saw the need for bold creative in traditional media and a growing need for digital marketing. Koeppel put her talents to use and fearlessly started a new business – a marketing agency by the name of Ocreative Design Studio. The name, rooted in the phrase, “Oh that’s creative!“, connected her eye for design, with the common response she would so often get when showing her work from her very first studio – thus Ocreative Design Studio was born. Initially, Andrea ran Ocreative as a one-woman show, wearing every hat from designing to managing the business successfully to attract more clients. As need grew, the business quickly added additional creative talent and saw steady growth year-over-year. A growing staff and space led the team to drop “Design Studio” and take on the simple and unmistakable moniker, Ocreative. What started as one woman working in a small room delivering big ideas to regional clients grew to a talented in-house, eight-person team that partners with clients across the nation from Massachusetts to Hawai‘i. Ocreative’s clients have access to some of the most fun and knowledgeable professionals around – marketing experts who inspire, educate, and create tailored solutions. The team at Ocreative strives for open, honest communications, where everyone has a voice and they all work collectively toward the same goals. “Together, we’ve won several international design awards in the areas of graphic design, website design, marketing, and video,” states Andrea Koeppel. 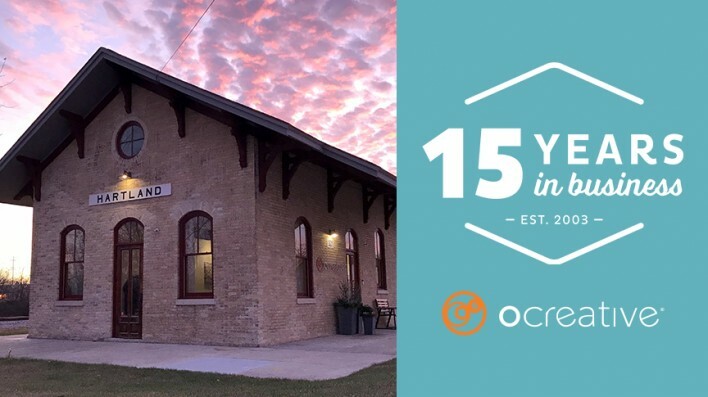 In 2016, Koeppel, along with her business partner and husband Matt Koeppel, purchased a historic train depot in downtown Hartland, Wisconsin and moved the agency from its original home in Oconomowoc. “This building is certainly the coolest building that we’ve ever been in—the high ceilings, original 1860s exposed wood beams and original old-growth pine floors. It’s like an old building in a new shell. The whole building was completely renovated in the last ten years.” shares Matt Koeppel, co-owner and Chief Business Development Officer. Uniquely their own, Ocreative is a Milwaukee-area integrated marketing agency with expertise and a robust background in developing seamless marketing experiences that drive mutually-rewarding customer interactions with a company’s brand across digital and offline channels. The company’s core values include offering the highest level of customer service, award-worthy quality, and performance that surpasses client expectations. The agency provides marketing and brand strategy, advertising and design, website design and social media, and video expertise to their clients, to not only meet their objectives for business growth, but to make a significant mark on their industry. To learn more about Ocreative, see their portfolio, and read their creative insights, visit their website at www.ocreativemarketing.com.